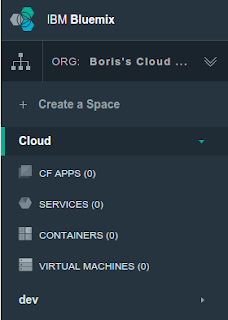 As Cloud Foundry is open source and does not rely on proprietary software or cloud infrastructure, it is completely possible to set up a Cloud Foundry client locally to experiment with Bluemix. That’s exactly what we will do later in this posting to get familiar with it. There is nothing better than learning by doing. Cloud Foundry is designed to support multiple developers in isolated spaces within orgs (organizations) to push applications into. There is a user role within Cloud Foundry (OrgManager) that allows users to create orgs. When using Bluemix, this role is assigned to Bluemix administrators and, by default, the Bluemix user does not have permissions to create or delete them however the user is the administrator of the org itself, so it is possible to create/delete/modify spaces within it. By default, the name of the org is the user name. It is possible however to rename the org. Every application and service is scoped to a space. A space provides a set of users access to a shared location for application development, deployment, and maintenance. 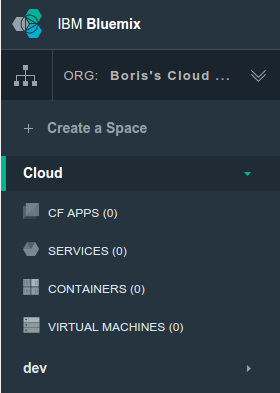 Each org contains at least one space and it's called "dev", by default, in Bluemix. Go to https://github.com/cloudfoundry/cli/releases and download and install the appropriate release for your platform. to get help on a specific commands. Run the following command which sets the API endpoint, or target URL, of the Cloud Foundry instance's Cloud Controller URL. 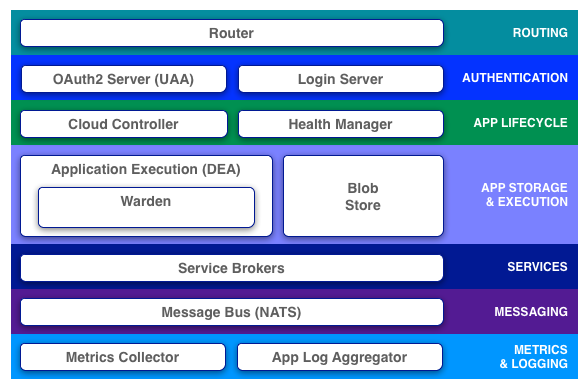 The Cloud provider, in this case, Bluemix, typically supplies this. As suggested we will now login into Cloud Foundry. The "-u" option is the username. 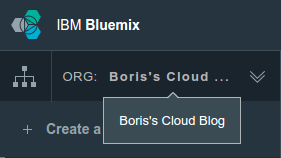 > cf rename-org <Bluemix username> "Boris's Cloud Blog"
If you login to Bluemix you will see that the org has been renamed on the Dashboard. We'll also create a new space for our work. 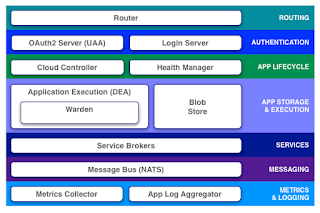 Create a new space called "Cloud"
Cloud Foundry consist of several components: routing, authentication, application lifecycle storage and execution, messaging (for inter-component communication), metrics, logging and service brokers that provides service instances when developers bind those services to applications. (Services can be provided using a SaaS model). Applications can be built with different programming languages and technologies, Cloud Foundry has the concept of buildpacks that provide support for them. Let's see what buildpacks are available on IBM Bluemix. Different buildpacks have different functionalities specific to the development technology support being provided. For example, the Java buildpack support includes support for Java Main, Servlets, Spring Boot CLI and Play Framework. When "pushing" an app to Cloud Foundry, it will examine the contents to determine which build pack should be used. The buildpack can also be specified on the cf command line when pushing the application, this is how custom/community buildpacks can be used. In the next blog entry, we'll create an app using the Java buildpack and deploy it to the new "Cloud" space we created.